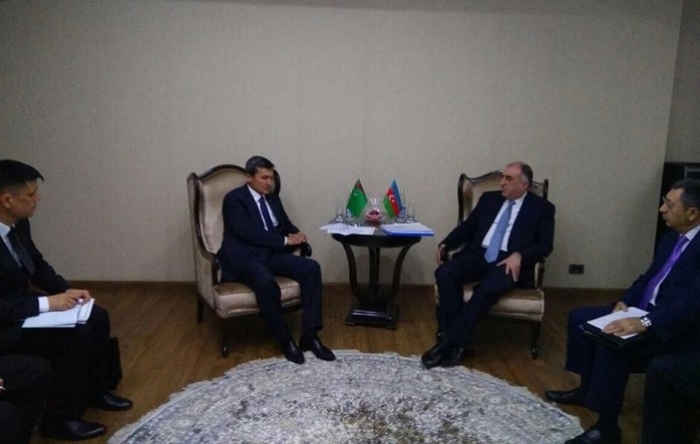 The 4th trilateral meeting of the foreign ministers of Azerbaijan, Turkmenistan and Turkey, Elmar Mammadyarov, Rashid Meredov and Mevlut Cavusoglu, respectively, kicked off in Baku on Wednesday. Firstly, the ministers will hold bilateral meetings. Later on, the meet will be held in a trilateral format. The foreign ministers will hold a joint press conference following the meeting. The first trilateral meeting of the Azerbaijani, Turkmen and Turkish foreign ministers took place in Baku on 26 May 2014. In addition, Azerbaijani President Ilham Aliyev, Turkish President Abdullah Gul and Turkmen President Gurbanguly Berdymukhamedov held bilateral and trilateral meetings on the sidelines of the 4th Summit of the Cooperation Council of Turkic Speaking States on 5 June 2014. On the basis of the results of the second 29 January meeting in Ashgabat held in the abovementioned format, the Framework Programme of the Azerbaijan-Turkmenistan-Turkey trilateral cooperation for 2015-2017 was adopted. On 28 August 2015, the foreign ministers of the three countries met in Turkey’s Antalya city. The meeting ended with the adoption of the Antalya Declaration. Later on, the first meeting of the joint Technical Committee on the Caspian transit crossings between Azerbaijan, Turkey and Turkmenistan.